My villa with 6 bedroom, 3 bath room, big living room, reading room,kitchen, and big yard with flowers, trees, grapes and vegetables…it is quiet but everything is convenient. I will greet you at the airport and pick you up to my house if I knew your flight number before your arrival and bring you to the you finish your staying. Drive you to the destinations every day, and be your guide also according to your travel schedule. The west tombs of Qing dynasty is the largest eco-cultural tourism site, one of the world's cultural heritage. It locates in Yi County in Hebei Province, 60 kilometers away from my villa. The west tombs is the cemetery for four Emperors, three queen’s tombs and total has 14 tombs and many speical ancient architectures. The scenery is beautiful and with the biggest ancient pine forest in northern China. The most important is here is quiet and have not as many visitors as Ming tombs. Langya mountain is near by Qing weat tombs, with beautiful valley and a special peak with a rememberale Tower, during World War Two(1941), five anti-Japan fighters jumped down the cliff to escape catching by Japanese when they used up their all bullets and stones. Fortunately, two fighters were survived and had a long life. The Great Wall is very famous in Beijing, but most parts were rebuilt during Ming dynasty, you can see the real Qin dynasty Great Wall in Yi county mountain, it is 70 km from my villa. The tunnels locate in Baoding Qingyuan county, it is 70 km from my villa, they were built during the World War Two. The tunnels could connect all families in the village, and even connect other villages. The villagers used the tunnels to avoid the hitting from Japanese. They were destroyed by Japanese and rebuilt by villagers many times. any place could have entrances of the tunnels in the village. And have many holes for shooting. There are some factories for making guns and other weapons. Besides you visit the Qin Great Wall, you also can cross a big reservoir(deepest is 80meters) and watch some natural images on the cliff by speedboat, it can enjoy yourself to the full. I can drive you visit any famous place if you want. One was called Solar Village in Shunyi of Beijing. It has 115 children. The children come from prisoners, aged from few months to 18 years old, the children can study free in local school, they participate some labor in their special home after school. Another is Langfang Children's Village (Philip Hyde Foundation): There are more than 90 children and with a hospital. The chief is Beitemun( American). This Children village is largest foreign institution for children with disabilities in China until now. Visit martial arts schools and watch Chinese martial arts showing, the students study both martial arts and ordinary courses. Visitors can do some exercises follow them or ask a local coach to teach some if visitors like. Visit ordinary Chinese families in rural area and in town. Try to know what is their life, and what they do and what they eat in their daily life. Visit ordinary primary and secondary school and exchange with the local teachers and students and also can view their classes. we can hold a party to be together with local children and families to show some programs or make a game in my villa. Exercise cooking Chinese dishes in our kitchen with Chinese housewife or ask for a chef Professor to teach. My friends come here and Make dumpling together then enjoy our delicious foods. Hold a party with local children and study language each other. We can go downtown shopping and then taste delicious snacks if you need. We can have a relax fishing besides cross the big reservoir. And then ask local people cooking the captured for us. In the early morning, farmers come to the street to sell their products, some is very fresh and special. You can see some special local shows at special time if you are lucky. We can go to some restaurants to enjoy Beijing Roast Duck that are for local people not for tourism, they are cheaper and need not wait long time. The restaurants with many trees, plants and fishes surround you, enjoy your dishes and beer and relax. They are small restaurants, but they are very fresh and delicious and cheap. I can cook special Chinese noodle for you all. (1) Owner be your guide, interpreter. It is my pleasure to help you. I like you know China more and more. I can help you make the best itinerary according to your need. You can ask me any question even you do want not come to my home. I like introduce Beijing to you. I want you remember Beijing. Note: the Rates marked is only for staying, all other side services is not free, how much the guests need pay for the side services? we can talk. but guide is free. my name is Liu xi xue, English name is Lucy, I live in Beijng, I have chances to go to many places over the world, my most like is China's Yunnan and Xinjiang, because these two places are special. I always have a willing, that is to tell the person who is friend of mine and deeply loves the nature. I am a volunteer for the Global Village Beijing China, devote to the environmental protection, hope each people can save the resources. As a Chinese, I am willing to show the natural landscape, the history, the culture and many precious things of Chinese some places to the world friend. If I have chance, I can introduce China's history, the culture, the tradition and so on to the friend, enables us to be more mutually exchanges and the study, share humanity's civilization. I like Yunnan and Xinjiang, because of their special natural condition and the historical culture. They are the places where external civilization affect on them least. There life and the culture have given us many inspirations, let us understand the nature, understands the human history. if I have more chances I will tell you some thing about Xinjiang's situation. Certainly, I also hoped you tell me some things from other places. Then make more people in the world know more natures and people’s life and make peoples more tolerance and wider bosom and more peace and study each other. when I was young, I had a very hard life. I also have a hard work after my graduate, my work was Geophysical exploration in desert. 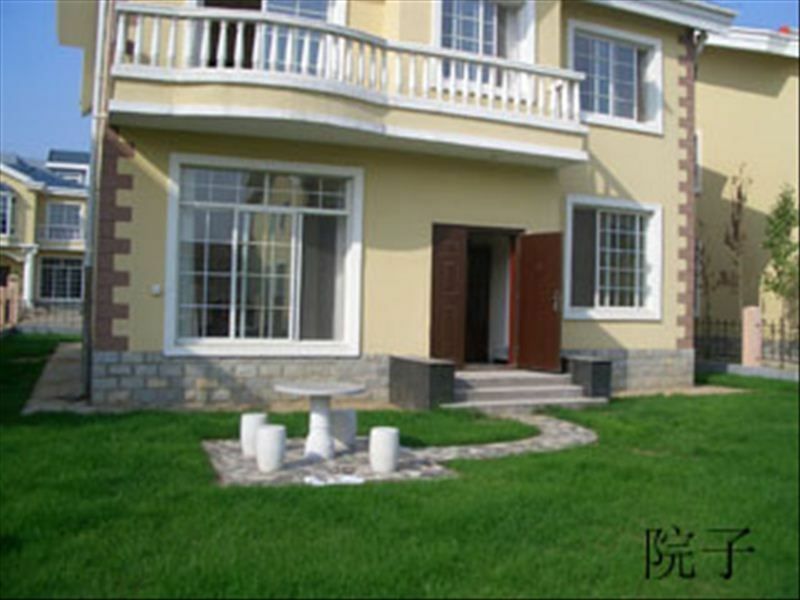 I saved my money to buy this house in suburb of Beijing, but I find it is too big to my family, so I supply it to my guests. you can get fresh air and fresh vegetables from the yard. every thing is convenient from here. you can know Chinese daily life and special people's(in difficulty) life and learn Chinese cooking and Language besides visiting the most famous sightseeings in Beijing. We spent a week here and had an absolutely wonderful experience (me and my wife, and four kids ages 9, 7, 5, and a newborn). Staying outside Beijing allowed us to experience many sides of China, and in some ways the rural parts were even more interesting than city attractions. The owner took us places we never could have ventured—very authentic cultural experiences that were interesting and enjoyable in so many small ways. We spent a few days visiting Beijing, and actually enjoyed the car ride because it gave us time to talk to her. She arranged for a driver who was extremely helpful and professional. She also attended very closely to our needs, which, because we were traveling with children, often meant changes in plans. She was extremely accommodating, and continuously worked with us to plan the best possible experiences. We sampled many restaurants, enjoyed some of her delicious home cooking, and enjoyed many local curiosities in addition to the typical (and impressive!) Beijing attractions. She was simply outstanding and very easy to get along with. Accommodations were spacious and comfortable, and gave the kids room to play. Beds and linens were very clean. I can second what another reviewer said about the hot water being limited to one user at a time, but it wasn’t inconvenient. Potential issues might be a lack of WiFi (although we had internet through the house computer) and limited cleaning. If you’re looking for a full service hotel with all the amenities, you may not find everything here. However, these slight drawbacks were far outweighed by the graciousness of our host and the wonderful experience she provided. Be sure to clarify costs beforehand. In addition to the quoted rates, we paid for all restaurant visits (including her food), all groceries for the cooking she did for us at home, the driver, and everything else. We had no problem with this, because prices were good, and it was undoubtedly worth it having her as a guide. Just realize that some costs are ambiguous, so if you’re on a budget, be sure to communicate with her about it and she’ll be very helpful. One of the best cultural experiences we have had as a family. The owner is absolutely great to work with, and did everything she could to help us have a good week. Her flexibility in this regard was particularly meaningful due to our oft-changing circumstances with kids. If you’re okay with something different than an upscale hotel, you will enjoy this stay! thank you for your review, I can receive you as my good friend and bring you to visit some more special places if you come here again. and no matter where guests come from, all trvavelers can get a much different travel if you try to stay in my house. The Home is large as advertised, however it is farther from Beijing than we imagined. It is located in a suburban farming town of 600,000 residents, in the city of ZhuoZhou, about 70 KM south of central Beijing. We were able to see a lot of the farming community outside of Beijing, but it was a long drive from many Beijing historical sites. In hindsight; I would have preferred to stay in downtown Beijing for 3-4 nights to see the sights accessible by subway or taxi, and I would have scheduled a few nights stay in ZhuoZhou to visit the farming towns and sights south of Beijing. --- The owner is very helpful and takes pride in her duties as tour guide for her guests. The owner is well educated about the local history and historical sites, and did a great job as tour guide. Our guide took us to see a good cross-section of Chinese life, and we visited a nice sampling of restaurants that specialized in different types of traditional and local cuisine. The owner/guide also prepared a wonderful “goodbye dinner party” featuring delicious dishes & warm company consisting of several neighbors --- Nice features about the house include the following: 1) Large and furnished. 2) New refrigerator, coffee maker, and the kitchen was equipped with most items. 3) We had use of the house computer with internet. 4) Screens on all windows. 5) Garden with fruit trees. --- Rustic features about the house include the following: 1) The hot water flows very slowly and is barely enough for one plumbing fixture at a time, which is supposedly common in China for private homes with solar heated water. 2) Air conditioning is limited to 3 of the 6 bedrooms and in the living room. 3) We encountered a complete failure of the electrical system on the first night of our stay that left us without electricity until the second night, but we had no electrical problems after it was repaired. 4) The front door latch could not be opened without a key when unlocked and we were never offered a key to the house, therefore we left in the morning with the owner and driver, and were let back in at night to sleep. 5) There is no WiFi or ability to access the internet by LAN, but we were able to access internet through the house computer. 6) The house is far from Beijing City so a driver is necessary. The owner's driver was very good and prompt; his van fit our family of 7 plus tour guide comfortably. This is a good suburban base for driving tours but not a central urban base for city transportation. Wonderful experience - gracious host - lovely home! My family and I (to include my 82 year old Mom!) enjoyed our stay in this home immensely. The owner is a gracious host that provided us with pick up and drop off at the train station and airport. She put together a terrific itinerary for seeing the main sights in Beijing and the surrounding area. We enjoyed wonderful meals, both at restaurants of her choosing and at home prepared by her and an assistant. She is rich with understanding of Chinese history and culture. The only slight draw back is her home is an hour south of Beijing - but this actually proved to be a good thing, as we enjoyed our time to learn and discuss during the van rides. Also her "town" (800k people) provides another view and you see a lot of country side enroute - we loved it! thanks for the review from my guest Tim, he has become my friend now. and welcome all guests over the world come to my home, I will make you at home, and be your friend, guide and driver!! I am the onwer of this house, and it is first time to use this website, i do not know who will become my first guest form this website, I will discount 20% for my first lucky guest!! my house locates in the south west suburb of Beijing, it is a town, its name is zhuozhou. it is 60km from Tian An Men. but the traffic is very convenient, you can by city bus, car, and train. Golf: there are three golf playing places nearby my house, you can rent any golfing facilities in them. and it is not expensive. Ski: you can ski here only during winter season .